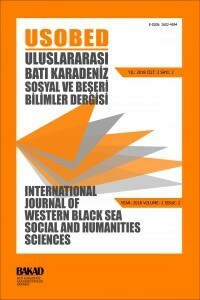 USOBED (International Journal of Western Black Sea Social and Humanities Sciences), published by the Association of Academies of Western Black Sea; It has been broadcasting since 2017 in social and human sciences such as Economics, Business, Finance, Political Science, Public Administration, International Relations, Labor Economics, Industrial Relations, History, Philosophy, Psychology, Sociology, Islamic Science and Geography. It is a refreed journal and is published twice a year in June and December. Articles submitted to the editorial board are subject to the evaluation of two or when necessary three specialist experts, in the Refree Board after a preliminary examination. Desired work of publication of our journal must be submitted to the editorial board in accordance with the following writing rules and other conditions. There should not be any descriptive information about the writer on the article. Information such as author name / names, location / locations, e-mail, etc. will be added to the article by the editor at the end of the process. If the article has more than one author, do not forget to add other authors / writers by clicking on the "add author" button in the relevant section of the article uploading step. Only the articles not published elsewhere or not yet in the evaluation process to be published can be submitted to the journal. At the end of the evaluation process, if the article is accepted for publication, all publishing rights of the article are owned by USOBED journal. Every process in the evaluation step of the article submitted to USOBED journal is sent to the authors by e-mail. However, some messages sent over the system are blocked by the author's e-mail server or are thrown into the spam folder. In this case, the negative result such as reports or correction requests not reaching the author is coming out and the evaluation process is lengthening. It would be healthy for the authors to follow the relevant steps through the system in order to avoid a possible lack of communication. The headline article should be descriptive and constitute the main issues of the article. Titles in Turkish and English should not exceed 12 words if possible. The title of the manuscript should be written in capital letters in 12 pt and bold; The concept of "essence" should be used instead of abstract. Abstract should contain a brief summary of each of the main sections of the article and contain information that will enable the reader to decide to read the article in its entirety. All main headings, including abstract, should be written in 12 pt large letters, subheadings in small letters, bold and 12 pt. Articles submitted to our journal may be in Turkish or foreign language (English, French or German). A maximum of 100-150 words should be added with the Turkish and English languages (English and Turkish title should be included). Also, under this abstract, there should be "keywords" in Turkish and English which can define the field of the work. Summary if any; should be included at the end of the article, the information given should be expressed more broadly than abstract. Any findings or consequences that are not included in the research text should not be included. References should not be included in the text. Articles A4 size paper should be written in the following format. The article, including the bibliography, should not exceed 25 pages in number of pages and 8000 words in number of words. The article should be sent via dergipark system. In addition, the copyrigt form signed by the author / authors must be scanned and sent through the same system. The dimensions and general design of the journal should be taken into account when preparing the tables and figures. Shapes and tables should be titled and numbered and should be centered on the page. Title; should be placed above the tables and under the shapes. Equations should be given a sequence number. The sequence number must be in parentheses and at the far right of the page. All articles; Should be written in a format that conforms to the spelling guidelines outlined in the "American Psychological Association (APA)," The Journal of the American Psychological Association (6th edition), 2001 ". The 6th edition of Apa should be the version that authors will consider. Sources should be written in Latin alphabet. DOI numbers ,if any, should be added at the end of the source. Otherwise, the URL numbers for the article are written. For example;Vasfi, E. (1998). Hukuki Terimler, Ankara: Vadi. Vasfi, L. (2007). Hukuk Reformları Sürecinde Türkiye‟nin İnsan Hakları Sorunu. İnsan Hakları Haberciliği, (derl.) Sevda Alankuş, İstanbul: STE Vakfı. • When indicating the Books and Reports in the bibliography, the place where it was published first, then the bookstore, the name of the publishing house are written without specifying attachments such as "bookstore", "publishing house", "publication". • Single-author book Ansel, N. (2006). Sessiz Gün. İstanbul: Deki. Carlsen, S. (2009). Matrix: Ya da Sapkınlığın İki Yüzü. Bahadır Turan (Çev.). İstanbul: Encore. Abisel, N., Arslan, U.T., Behçetoğulları, P., Karadoğan, A., Öztürk, S.R. & Ulusay, N. (2005). Çok Tuhaf Çok Tanıdık. İstanbul: Metis. Katip, M. (Ed.) (2007). Kamusal Fayda. Ankara: İmge. Akyol, B. (2004). Saha Çalışmalarında Kamusal Alan Kavramı. Kemal Özbek (Ed. ), Kamusal Alan Dahilinde (s. 689-713). Ankara: Dost. Straight, W. Jr. & Walles, E. B. (2004). The Elements of World(7. Baskı). New York: Longman. Bulunması durumunda digital object identifier (DOI) numarası belirtilmelidir. Smith, A. (1976). An inquiry into the nature and causes of the wealth of nations. E. Cannan (Ed.). Chicago: University of Chicago Press. (İlk baskı 1776). In the Bibliography: Hengel, M. (1958). The Best Quality. T. Prast (Çev.). Chicago: Charles Scribner‟s Son. (İlk baskı. 1912-1917). Cenah, Y. (2009). Geçmişin Sosyolojik Baskısı: Tarihsel ve Toplumsal Akla Doğru. Toplum ve Bilim, 12, 202-240. Bilken, F. S., Çelik, P. (1998). Müzakere Yöntemleri. Kültür ve İletişim, 2 (1), 397-414. Editorial: "What is a Chaos" [Editorial]. (2006). Journal of Management and Business, 25, 8-10. In the Bibliography: Türkiye ve Rusya İlişkileri Ne Yönde: Bir Tarih, İki Devlet. (2003, 13 Aralık). Hürriyet, 36. Öymen, F. (2013, 29 Aralık). Siyaset ve Ekonomi. Milliyet, s.21. If it is downloaded from YÖK (Higher Education Board), the address of Url should be written at the end of the source. Erkan, F. (2012). Politika ve Yansıması: Mardin’de Sosyolojik Altyapı. (Yayımlanmamış doktora tezi). Celal Bayar Üniversitesi/Sosyal Bilimler Enstitüsü, Manisa. In the Bibliography: Ottomans: History. (1997). Encyclopaedia Britannica içinde (12. Baskı. Cilt. 14, s. 1170- 1188). Chicago: Encyclopaedia Britannica. In the Bibliography: Hellmender. (208). Political Dictionary (11. Baskı). Los Angeles, Longman. (Producer), Simpsonlar içinde. Episode: 1403 F55079. Fox. In the Bibliography: Micheal, K. (Yönetmen/Senaryo Yazarı). (2001). In the Bibliography: Ara, Güler. (1987). Ankara Milli Parkı [Fotoğraf]. Güzel Sanatlar Fakültesi, Ankara. After they have passed the evaluation process of the refrees to be designated in the "Refree Committee", articles will be returned to the author for correction, if any. The author must return it after making the corrections requested by the referee. The author (s) are responsible for non-compliance with the rules set forth in this announcement. In such a case, regardless of the referee evaluation report, the journal Publication Commission reserves the right not to publish the relevant article.